I ran out of chilli oil which I want to make some Szechuan Dan Dan noodles, so I decided to make some myself. Chilli oil is commonly called Red Oil in Szechuan and is an indispensable flavoured oil in Szechuan cooking. You can add this to noodles, wontons, stir fry or as a condiment. I think in Szechuan they use facing heaven chillies but if you don't have any you can use any chilli powder, chilli flakes or dried chillies blitz in a mini blender. The redder the chilli powder/ flakes you used, the redder the chilli oil. As you can see the oil is bright red and fragrant which is by far better than any shop bought chilli oil and not too fiery hot so I can use as much as I like. 1. Heat the oil in a saucepan till quite hot, add shallots, ginger, Szechuan pepper and star anise. Fry the spices for about 5 - 10 minutes at medium low heat till shallot and ginger turning light brown. Remove all the spices with a small metal sieve. 2. Add sesame seeds and continue frying till the seeds turn light brown. Turn the heat off. The oil is very hot, let it cool down for about 2 - 3 minutes. If the oil is too hot this will burn the chilli powder/flakes. 3. Add the chilli powder/flakes and keep stirring for a minute. Let it cool down completely then pour into clean jars. This recipe makes two small half pound jars. You can filter the oil if you wish, I quite like the sesame seeds floating on top and the dark chilli sediment on the bottom. 4. 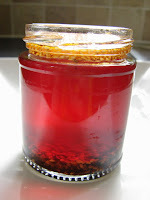 Storage: This oil will keep at room temperature for few weeks and longer in the fridge. Your recipe has come at an opportune moment as I am just about to run out of chilli oil - this looks far more exciting than the stuff I buy. Thanks for that and all your other recipes which have become indispensable!